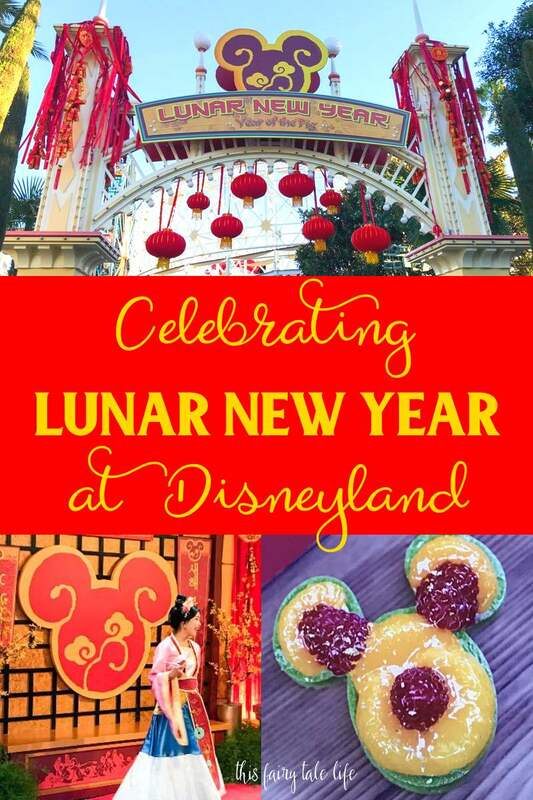 Celebrate Lunar New Year at Disneyland! 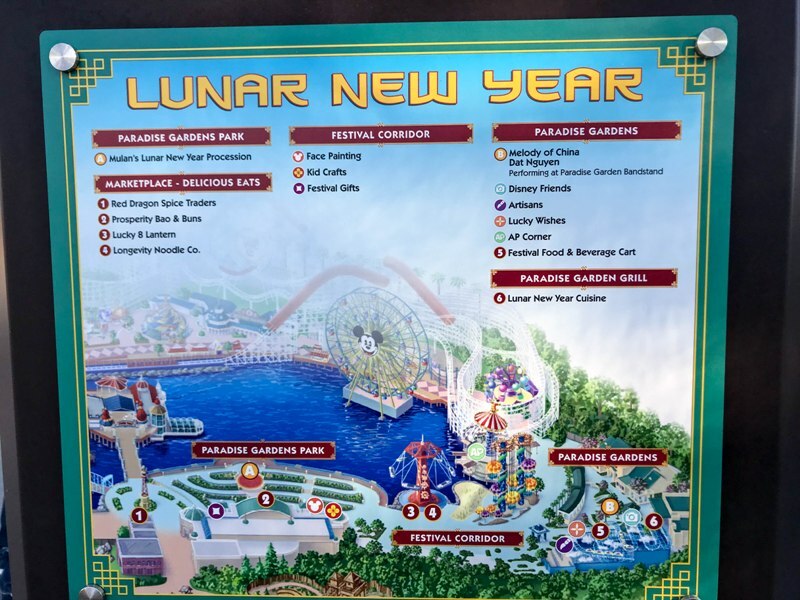 While The Disneyland Resort has been celebrating the Lunar New Year for a while now (the celebration used to be at the former Big Thunder Ranch Jamboree area), the last couple years Disney has taken it up a notch. Now the celebration takes place at Disney California Adventure with lots of activities and excitement throughout the day! 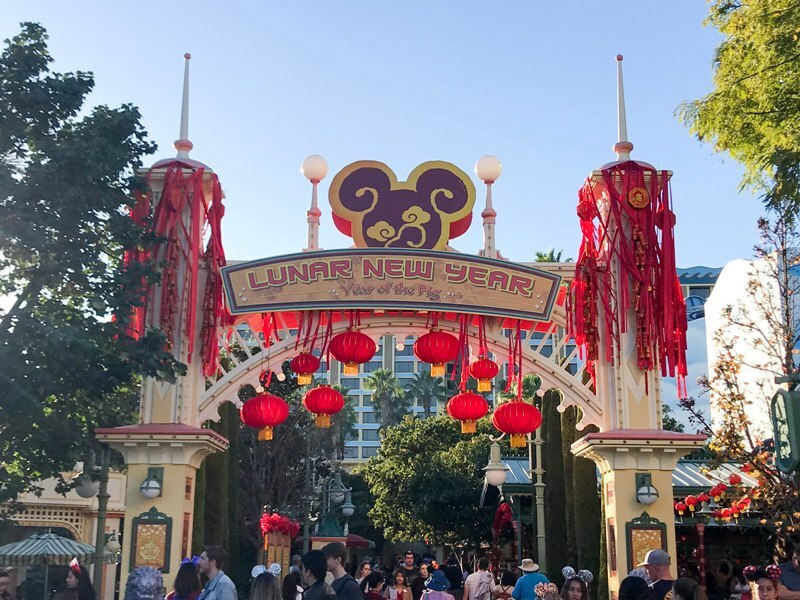 This year the Lunar New Year celebration takes place from January 25 to February 17, and takes place along the festival corridor (formerly known as the parade corridor), near the entrance to Pixar Pier, adjacent to the Golden Zephyrs and Boardwalk Pizza and Pasta. 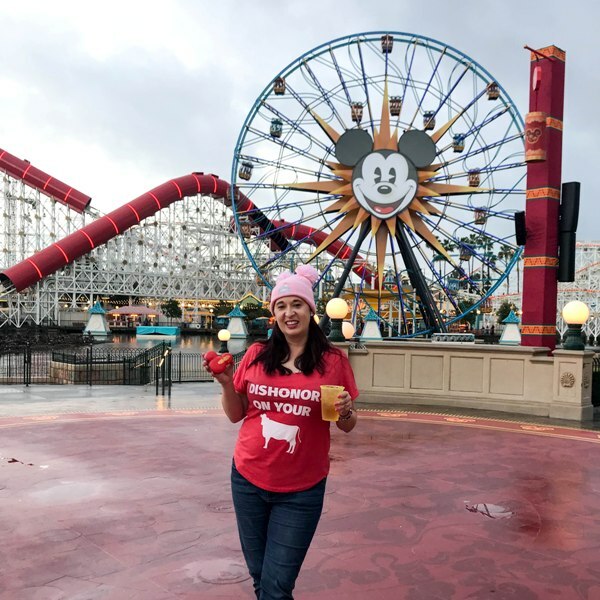 In 2019 we are celebrating the Year of the Pig! 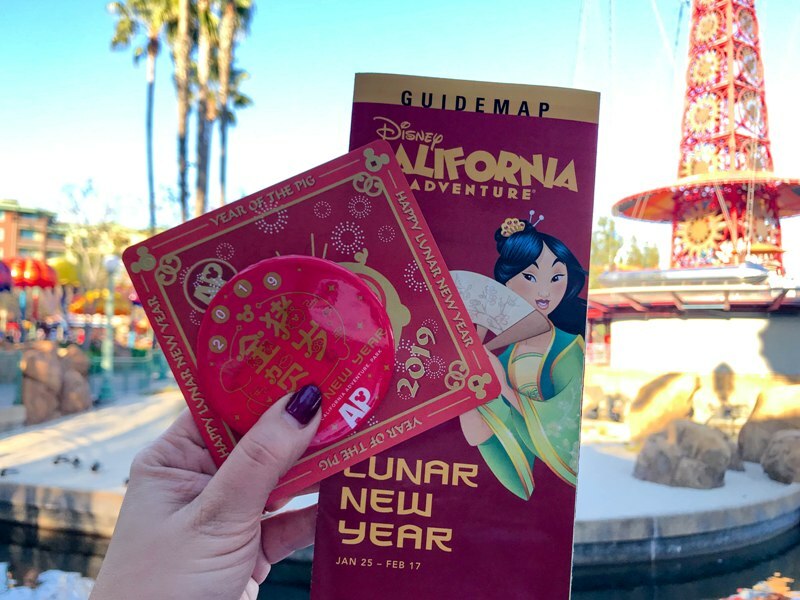 The logo for this year is really cute, and you may catch a glimpse of the Three Little Pigs during Mulan’s New Year Lunar Processional. 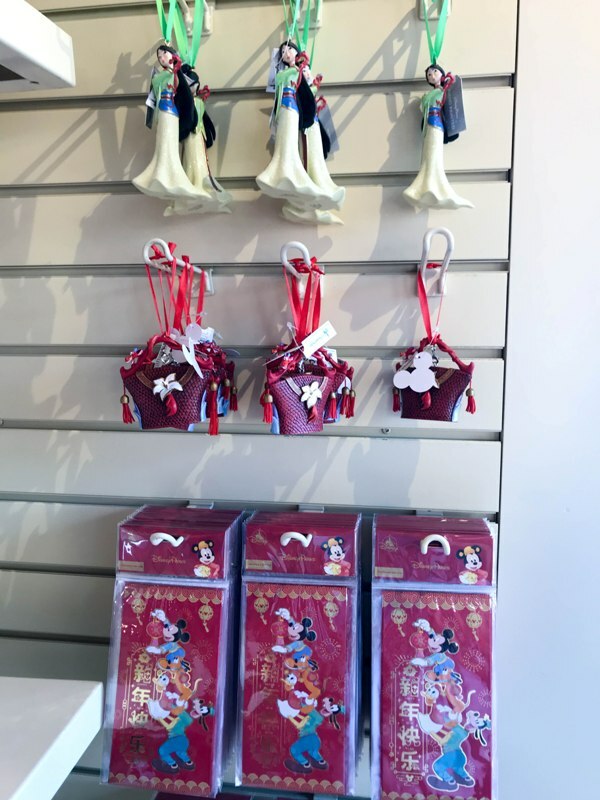 Meet & greets include Mickey, Minnie, and Pluto in special festive attire, and Mulan and Mushu! 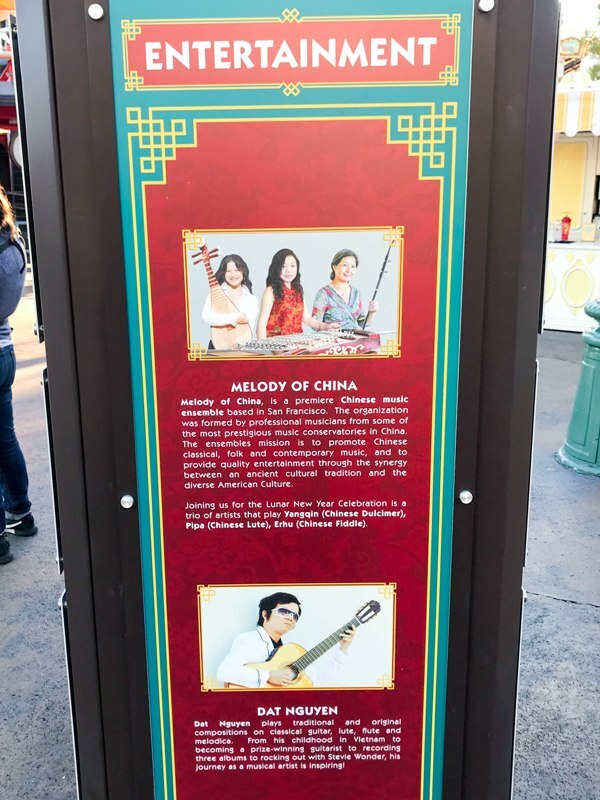 Mulan is my favorite princess so it’s always a treat to see her in the spotlight. 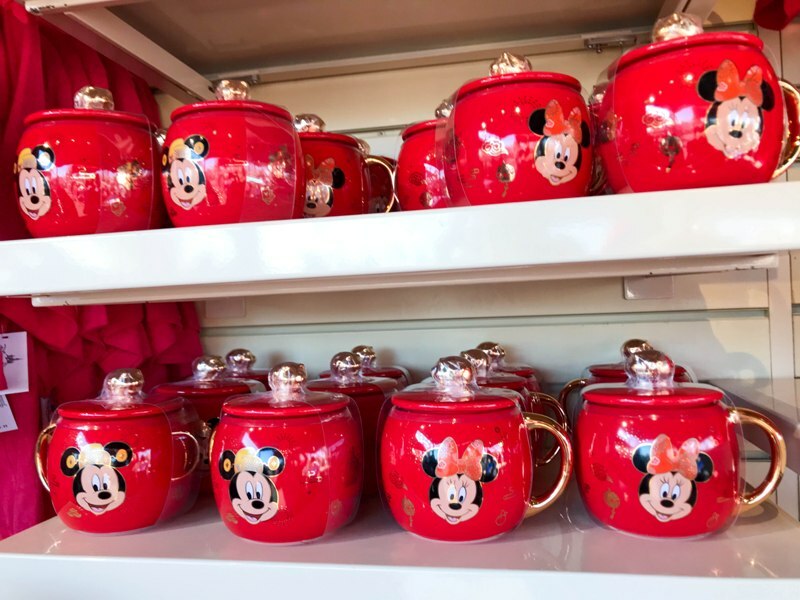 (Tip – the line for Mulan gets long … I waited and missed out on seeing her twice! 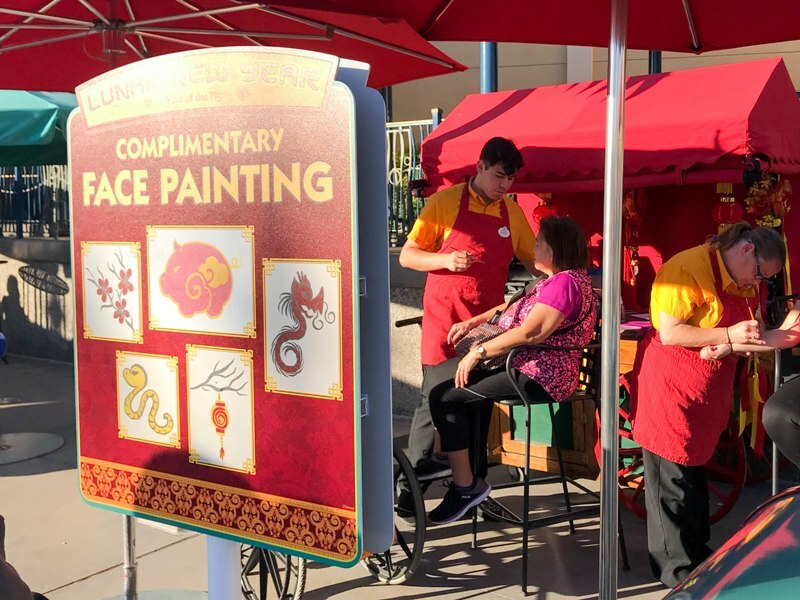 If you want to see Mulan, ask a Cast Member when she will be visiting and get in line at least 20 minutes ahead.) 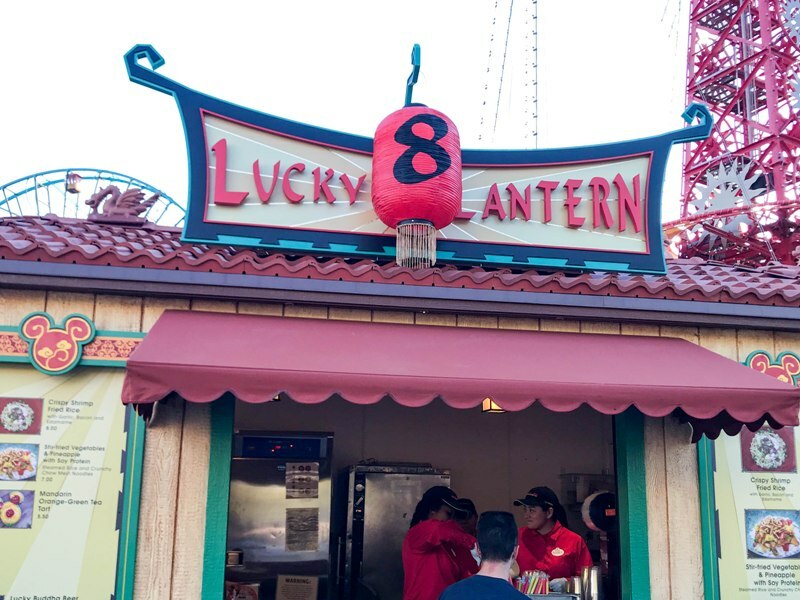 The character meet and greet location is under the big gazebo in Paradise Gardens. 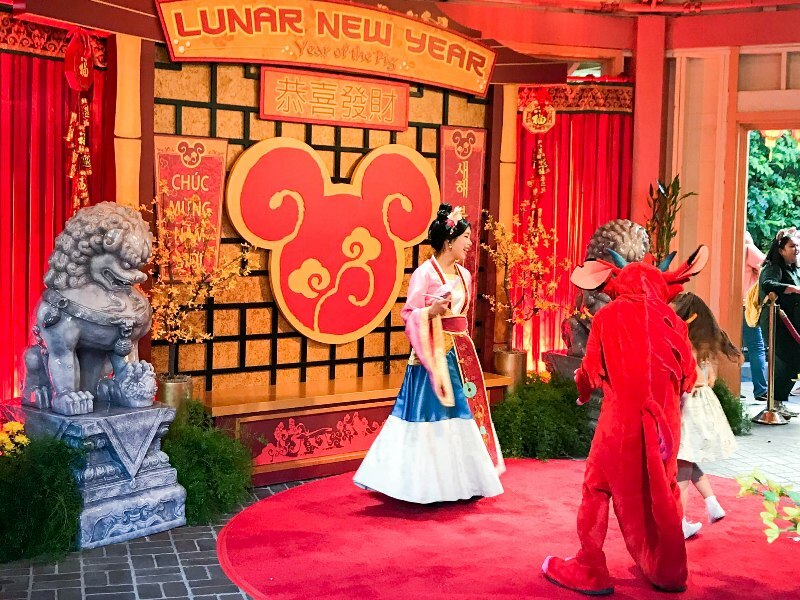 Aside from the meet & greet, you can see Mulan and her friends during the Lunar New Year Procession performance, which takes place at various times during the day (check the app during your visit). The Procession starts at Goofy’s Sky School and ends on the “stage” at Paradise Gardens Park. 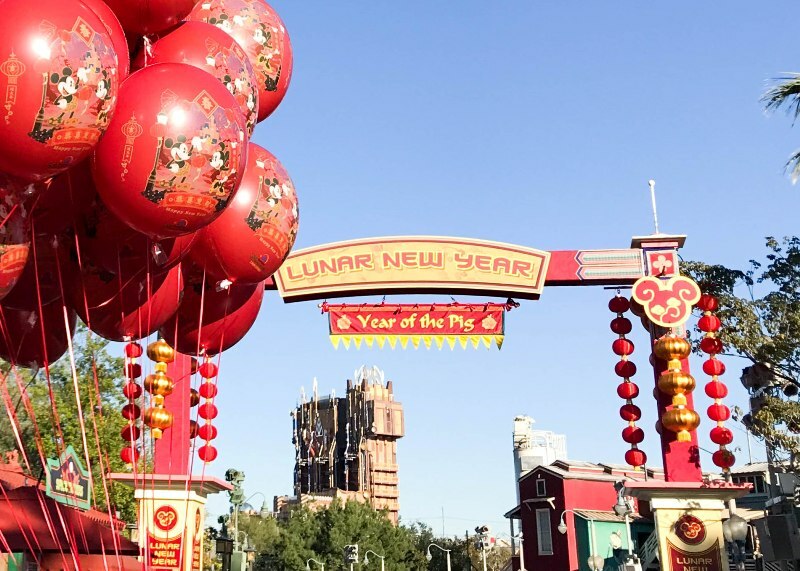 The Procession is a much bigger production in 2019 than in year’s past, and now includes several drummers and dancers, along with the Three Little Pigs and Mulan. I also enjoyed the activities, which are fun for kids and adults alike. 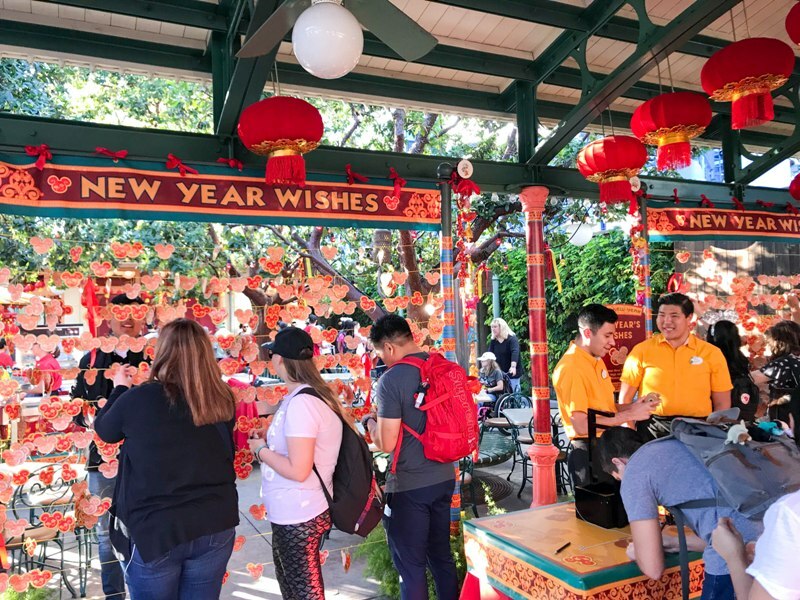 I left a wish on the Lucky Wishing Wall, and face painting and kids crafts are available near Ariel’s Undersea Adventure. All of these activities are free! And don’t miss some of the musical performances. You’ll find an array of talented performers at the Paradise Garden Bandstand and Paradise Gardens. 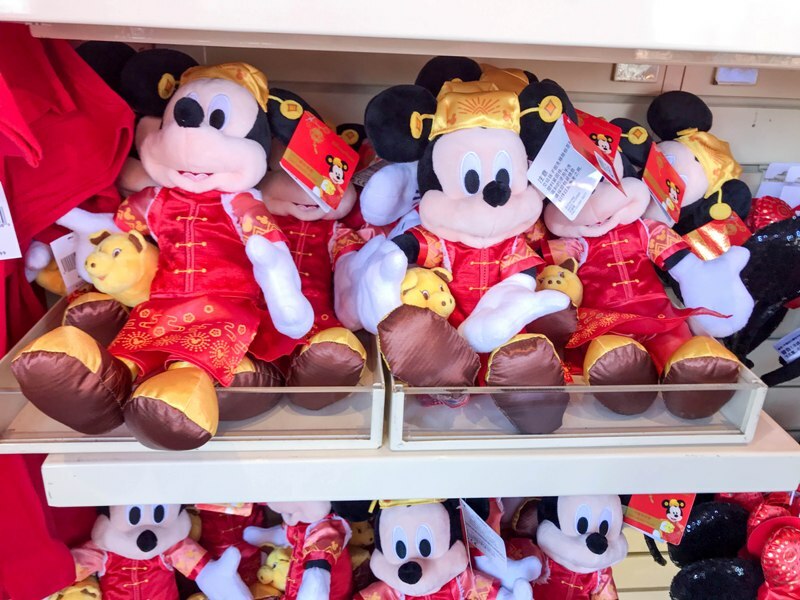 But my favorite part of the Lunar New Year celebration is the same as every holiday … the food! 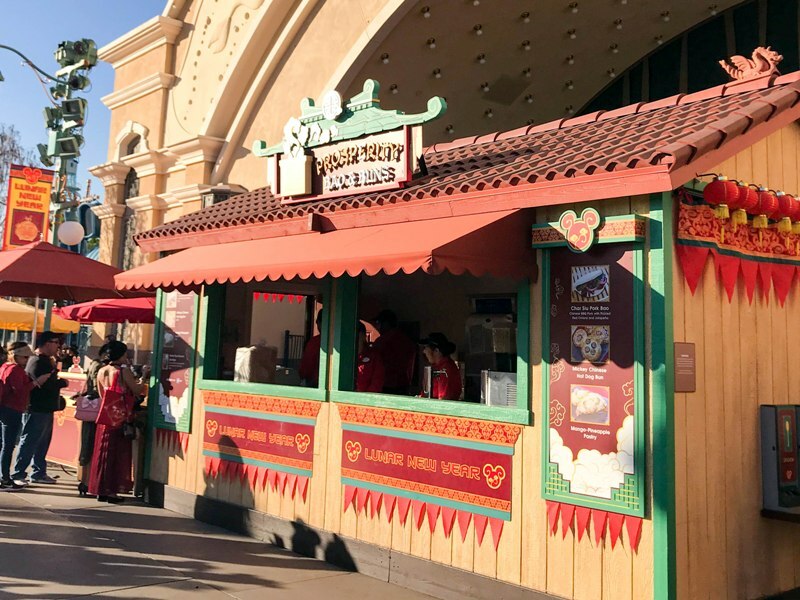 There are four food marketplaces set up this year, along with special dishes available at Paradise Garden Grill. 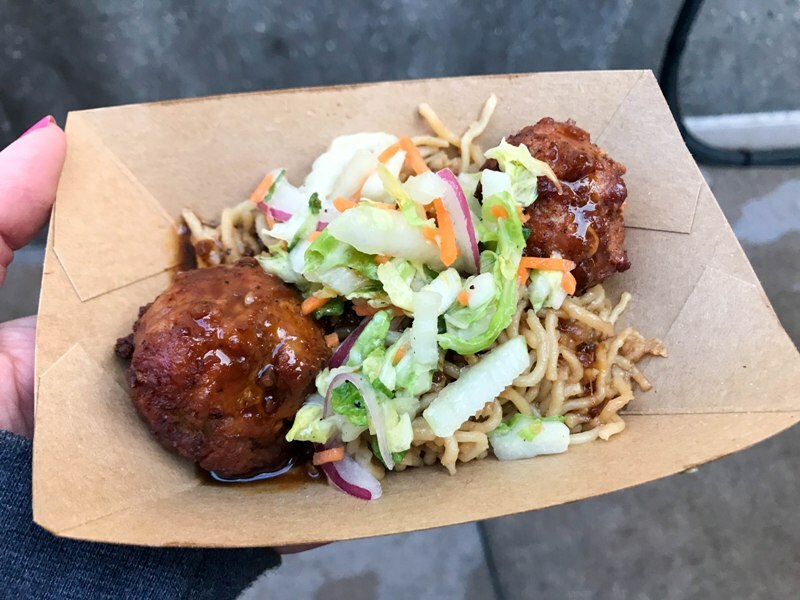 The Pan-friend Wheat Noodles with Chicken Meatballs were good. Truth be told I liked the noodles better than the meatballs; the meatballs were a little dry. 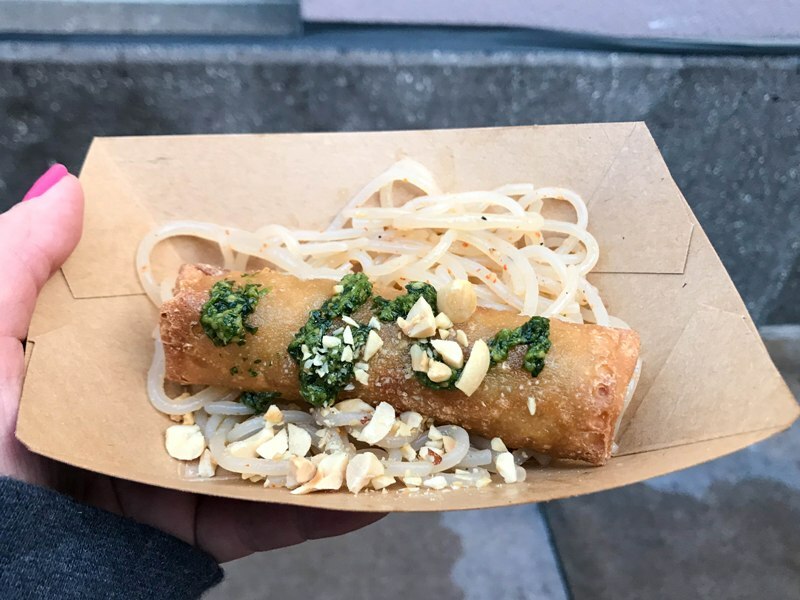 The vegetable egg roll was good but the noodles were way way way too spicy for me! I’m bummed because I love chilled noodles. 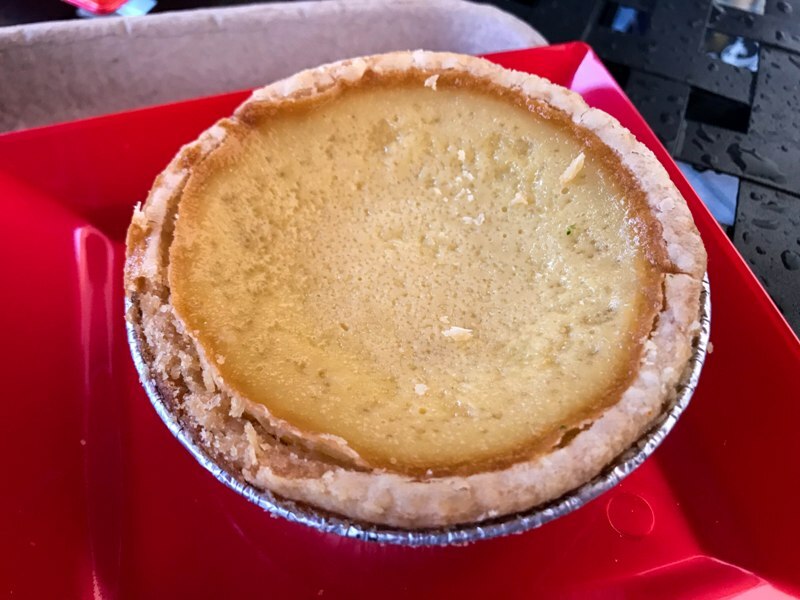 The egg tart is very light, not too sweet. Highly recommend this one! Big enough to share, for sure. 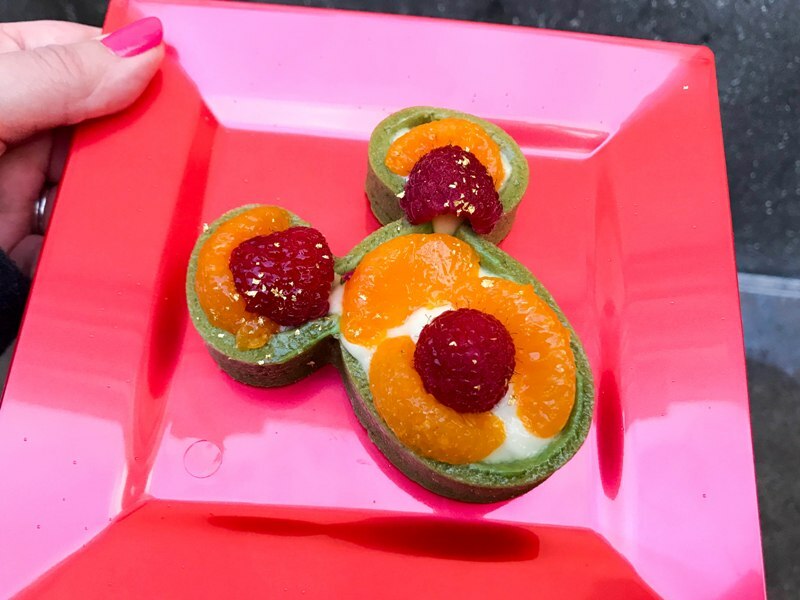 Tried the Mandarin Orange-Green Tea Tart and LOVED IT. Again, not too sweet and the orange slices on top were so fresh. Can’t wait to get this one again. 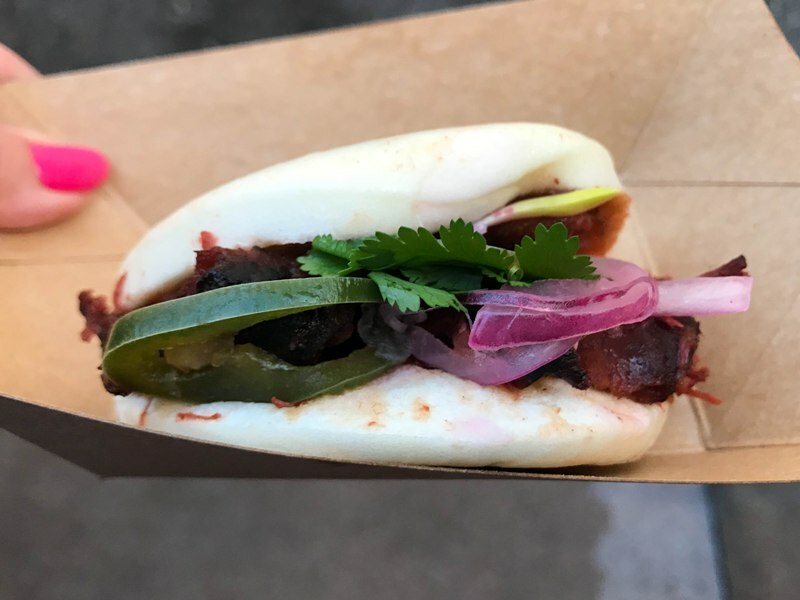 My friends got the pork bao and said it was good. 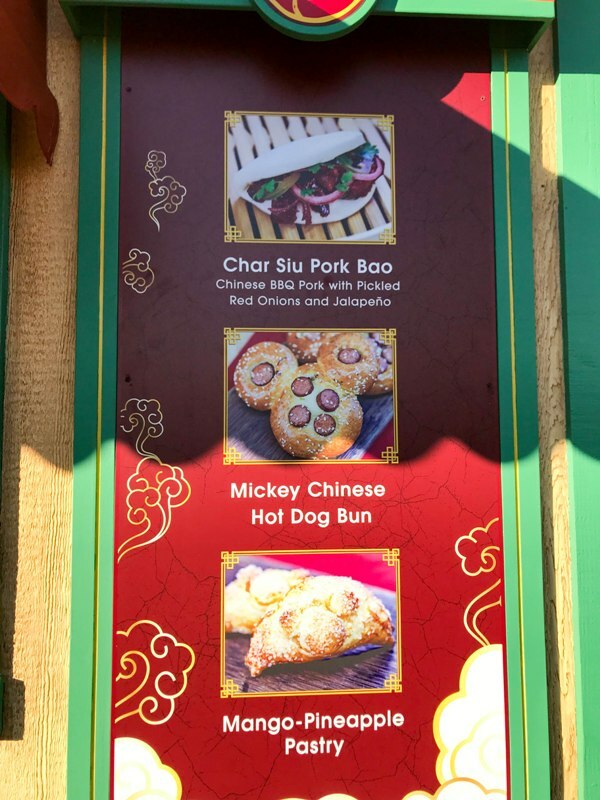 I also tried a bite of the Mickey Chinese Hot Dog Bun which tastes how you would think it tastes. 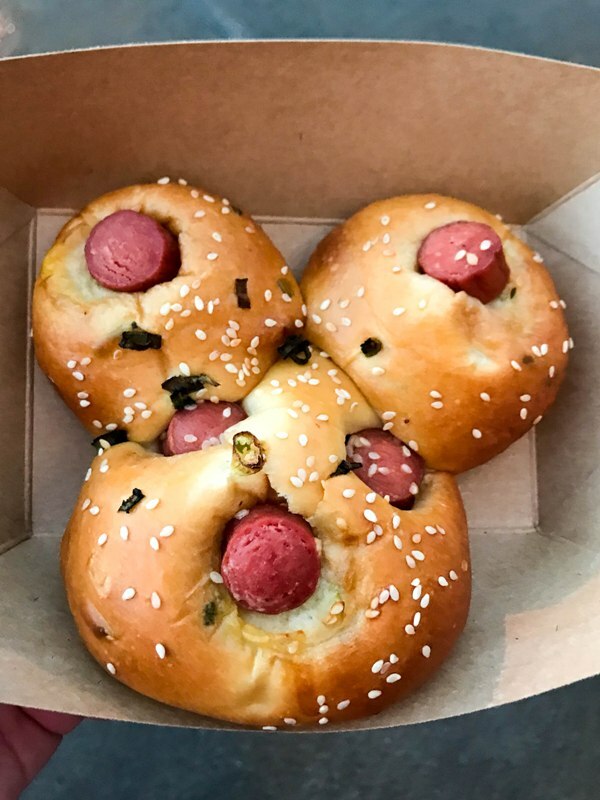 The bread is soft and fluffy, like a hot dog bun. I also had the Mule which had an extremely strong ginger taste. The only item I tried here was the macaron. Highly recommend! Not only is it Insta-worthy but it’s delicious. The production value on the marketplace signs is really improved this year! Everything looks so good. 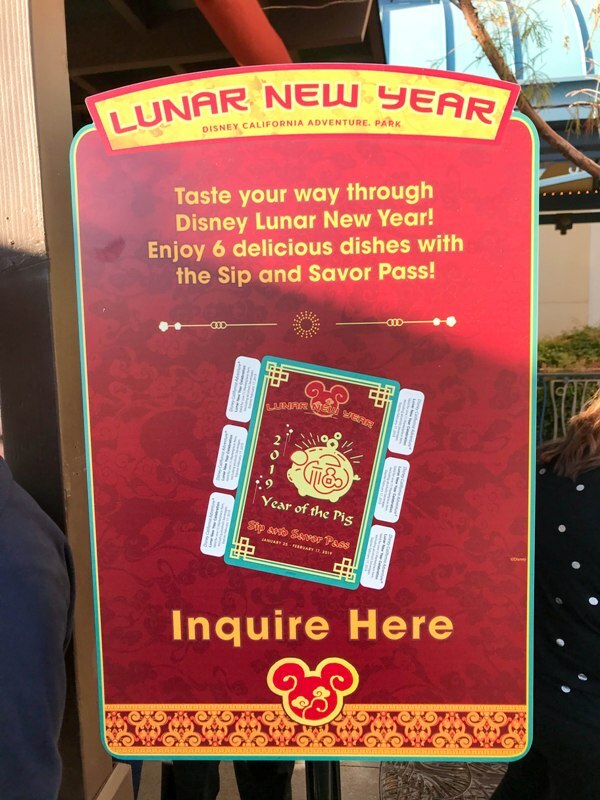 New this year is a Sip and Savor Pass! 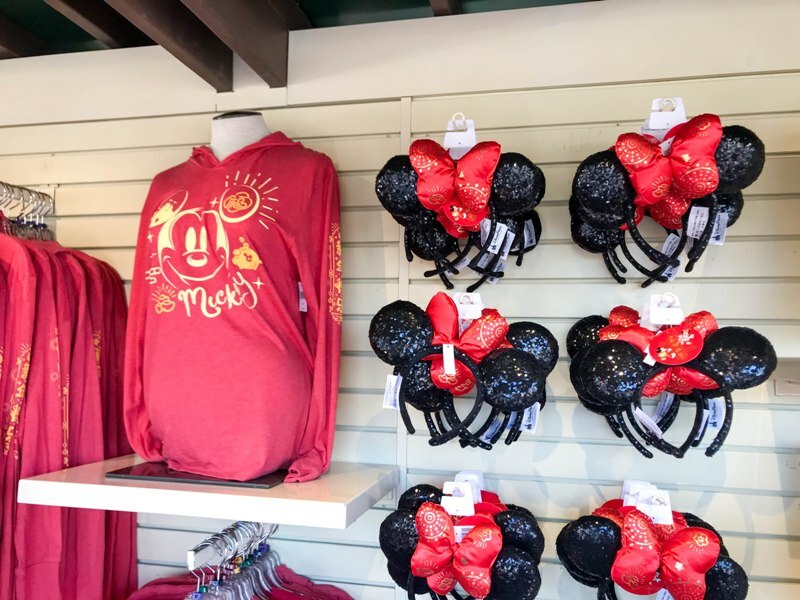 Six tabs are included, and it costs $39 with a reduced price for Annual Passholders. Use the tabs on food items that cost $6.50 or higher for the best value (excludes alcohol). 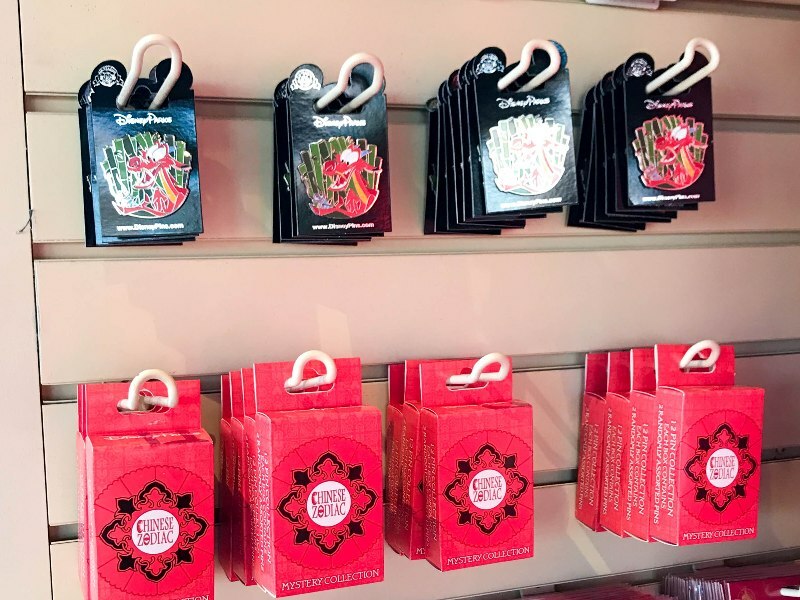 Purchase your pass at Kingswell Camera Shop on Buena Vista Street, Elias & Co., Festival Gifts (in Paradise Gardens), or at the Sip and Savor cart. Also starting this year (and hopefully continuing for future festivals) is the option to pay for ALL your food at one register, and pick up your food at the corresponding marketplaces. This will hopefully cut down on waiting in lines and the hassle of taking out your credit card at every single marketplace. Please note that if you are ordering alcohol, you will have to show your ID at every marketplace when you go to pick it up. I absolutely LOVE this idea; it’s going to save so much time and standing around! 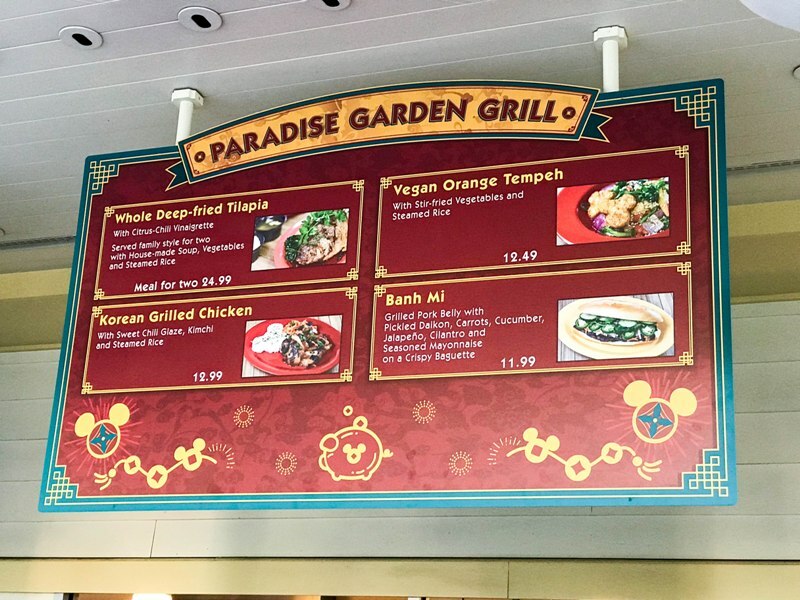 The seasonal food available at Paradise Garden Grill includes Whole Deep-fried Tilapia, Korean Grilled Chicken, Vegan Orange Tempeh, Banh Mi, Mango Mousse, plus Milk Iced Tea with popping boba, and Tsingtao beer. 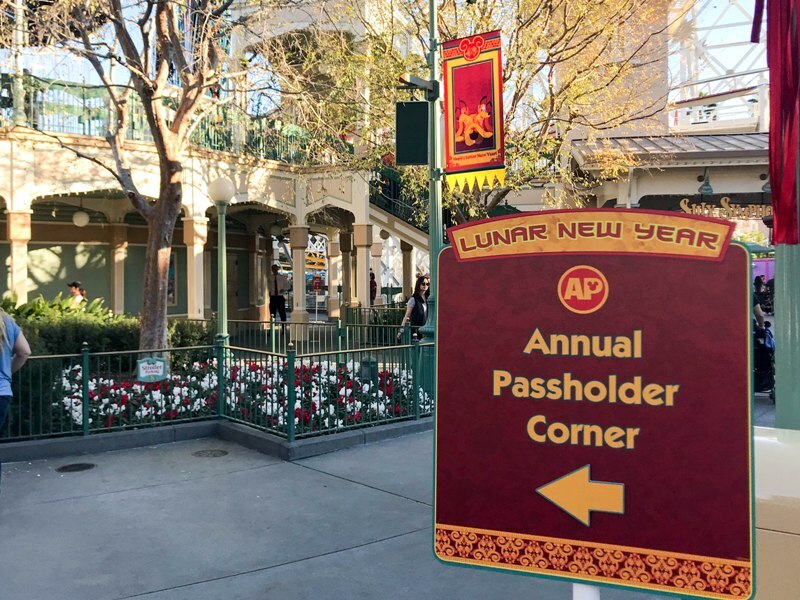 Annual Passholders, be sure to stop by the AP Corner to pick up your button and have your photo taken with the special photo background! 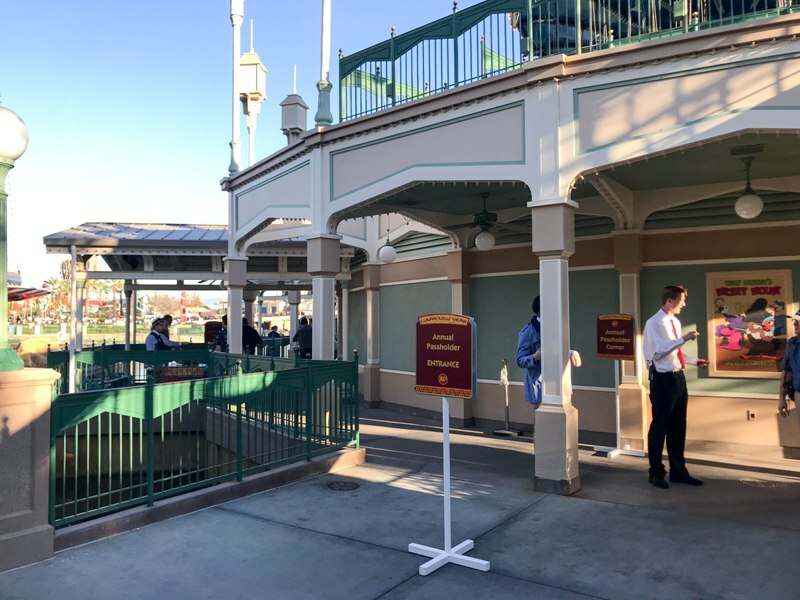 This year the AP Corner is located underneath the Silly Symphony Swings. Scan your AP pass to enter (they can scan your mobile device) and receive a cute button. 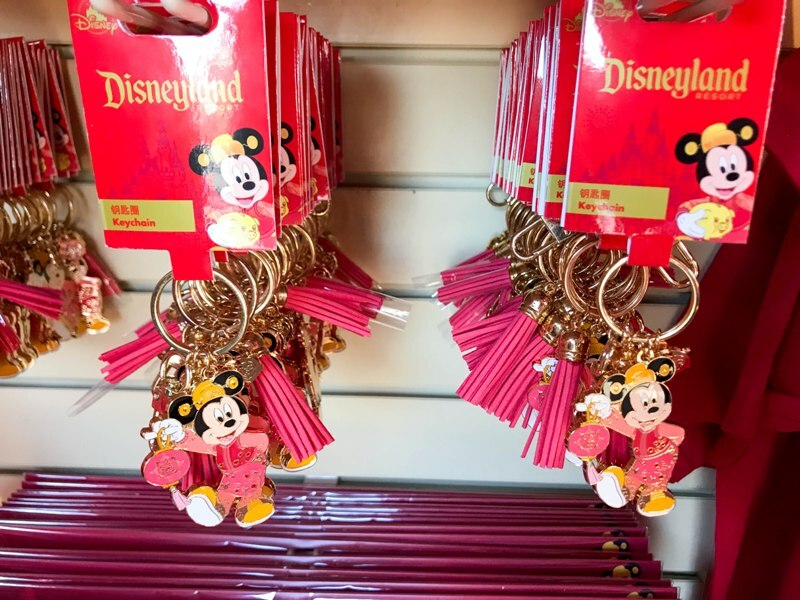 When you’re done eating, be sure to check out all the cute merch that’s available this year, including special Minnie ears and a Chinese Zodiac blind box pin collection! It’s a shame this festival only lasts for three weeks because it has become one of my favorites! 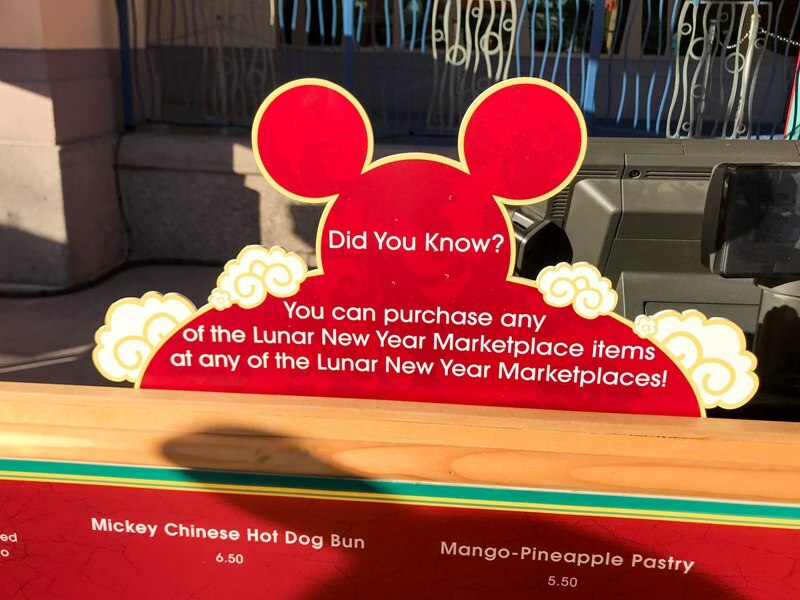 So don’t delay if you want to partake in the fun of Lunar New Year!